Varsity girls' basketball assembled an impressive season, ending 19-9-0 and competing in the final round of the Somerset County tournament and the semifinal round of the NJSIAA Non Public B South Sectional tournament. The girls came out strong in December, winning their season-opener (58-42) against Watchung Hills on December 18. Junior Alexia Allesch led the scoring with 16 points and 4 rebounds, followed by senior Lauren McBride with 15 points and 7 rebounds and senior Sam Kramer with 12 points and 3 rebounds. The team went on to a decisive 63-33 win over Franklin High on December 22 and then to sweep the Mount St. Dominic tournament – including a hard-fought win (47-43) over third-ranked Rumson Fair Haven. The girls remained undefeated through their first two contests in January, besting Paterson Eastside (63-47) and Phillipsburg High (59-27). Allesch led the way against Paterson, with 17 points, 9 rebounds, 5 steals, 3 blocks and 2 assists. 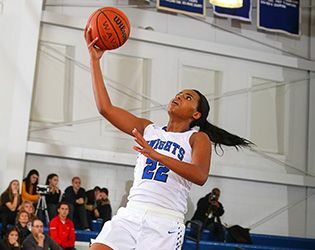 Following a disappointing loss to second-ranked Rutgers Prep on January 7, the girls pieced together a five-game winning streak before falling to Rutgers Prep again on January 28. February opened with wins over Franklin, Bridgewater-Raritan and Hillsborough. In the Somerset Country tournament quarterfinals on February 18, the team defeated Bridgewater-Raritan 54-46 in overtime. Freshman Nisani Santiago came up big, scoring 29 points and sinking 13 free throws. In the semifinal round on February 20, the high-scoring senior duo of Kramer and McBride combined for 37 points to help Gill to a 57-42 victory over Watchung Hills. The girls fell to Rutgers Prep in the finals. Finishing their season with the NJSIAA Non Public B South tournament, the girls bested Trenton Catholic 54-26 on March 1 to advance to the quarterfinal round, where they defeated Holy Spirit 59-48. Santiago hit game-highs in both matchups, scoring 26 points against Trenton Catholic and 22 against Holy Spirit. The girls fell to St. Rose in the semifinals on March 5, bringing a stellar season to a close. Looking ahead to next year, the senior lineup of Kramer, McBride and Gallic will be missed. Both Kramer and McBride hit the 1,000-point mark this season and Gallic posted 126 points over 28 games. Also missed will be the talented senior Kennedy Whitehead, who was sidelined with an injury for almost all of the season. Looking ahead, the team will rely heavily on the scoring power of Allesch, who averaged just under 15 points per game this season. Junior Allyson Coffey, who posted 91 points for the season, will also be expected to be an important contributor next winter, as will the super-steady Emma Dean '17, who played all 28 games, contributing assists, rebounds and points. Nyla Mulcahy '17, who posted 60 points and 42 assists this season, will be expected to take on a larger role next season, along with Katherine Howard '17. This year's team did not have any sophomores on its roster, but the talented freshman lineup bodes well for the future: Ilana Druskin, Emma Fetrow, Gillian Fritzlo, Hayley Goldin, Ansley Hopton, Kaja Mehta and Santiago. Leading the way among them is the offensive powerhouse Santiago, who posted 306 points this season.